Christian greetings in the precious Name of our Lord Jesus Christ; it is good to have your company as we study God's Word. We extend a warm welcome to our new subscribers and invite any questions, suggestions or corrections you wish to raise. Our main article, "Recognize Your Day," coupled with the items of current news, accentuate the importance of "walking in the Light of revelation Jesus is shining to fulfil prophecies pertaining to this our day" as II Peter 1:12 and I John 1:7 insist. Most people are religious, not spiritual, but content with a second-hand religion studied by their kind old priest they neglect to "prove all things for themselves and by personal revelation from the Lord Himself, hold fast that which is good." The host of denominational confessors impersonating the Word for a day gone draw a distinction from Christ's "little flock, who, in singleness of heart work out their personal salvation with deep reverence, shrinking back from all that might displease Him" (Philippians 2:12). Please read the news carefully because President Trump's actions taken in conjunction with the prophecies of Scripture indicate the end of the Christian dispensation is closer than most would think or dare imagine. Comment: Trump's unlawful act has resulted in mass protests in Palestine condemning his uninhibited decisions. As history, Jewish encyclopaedias and their most eminent scholars record, almost all Jews are non-Semitic aliens with no history in the Middle East. The modern word "Jew" has a meaning contrary to the two words it has replaced, "Judahite"—a descendant of the Tribe of Judah; and "Judean"—every resident of Judea regardless of race or religion: Chinese, Pygmy, Englishman, Eskimo, Palestinian, Muslim, Russian Orthodox or Hindu. The definition of this modern word "Jew" which did not enter the Bible until the latter half of the 18th century, is scripturally and biologically incongruous. In Ezra, Nehemiah and throughout the Old and New Covenants, descent in Israel and all of Adam's race is reckoned from the father as woman cannot beget (Deuteronomy 4:1-2; Revelation 22:18-19), however Jewry is a matriarchal society, which reminds one very much of Cain. God never made a covenant with Jewry, whose absolute is not Moses and the Prophets of Israel but the Babylonian Talmud. According to Jewish logic it seems the act of converting to Judaism miraculously changes one's genetic makeup! As Historian H. G. Wells wrote, "it's the power of assertion over fact . . . the Idumeans (Edomites) were . . . made Jews . . . and a Turkish people (Khazars) were mainly Jews in South Russia . . . The main part of Jewry never was in Judea and had never come out of Judea" (The Outline of History, 3rd Edition, p. 494). According to The Jewish Encyclopedia (Vol. IV, (1905), p. 3), the original stock of the Khazars came from the land of Edom. Britain was conquered in 1688 by 'Jews' from Amsterdam who financed William of Orange; it has since been a colony of the City of London as the united States, Australia and many other countries are colonies of the Empire of the City of London today. 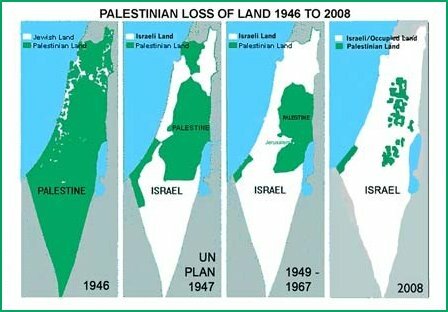 Non-Semitic Zionist self-styled Jews stole Palestine from the Israelite and Palestinian landowners in 1948 and the United Nations partitioned it into two states. Non-Semitic self-styled Jews dispossessed, murdered and exiled these Semitic natives on the strength of the Balfour Declaration, purchased with the blood of American servicemen and US treasure sacrificed in defeating righteous Germany which Jews betrayed in two World Wars. As [Jew-controlled] Britain solemnly promised to a second nation the country of a third which belonged to the Empire of a fourth, namely Turkey, President Trump met the bribe of his benefactors by stealing Jerusalem from Palestinians and Israelites and giving it to a third people, namely Khazar Jews who have no history in the Middle East. And non-Semitic, anti-Semitic Prime Minister Netanyahu has placed the modern state of faux Israel in violation of its agreement under UN Resolution 181 of November 29, 1947. Moreover, the site considered for the US Embassy in Jerusalem is Stolen Palestinian Private Property. Resolution 181 gave 'Jews' 56% of historic Palestine, Palestinians 42%, 2% (including Jerusalem) kept under world body trusteeship. In December 1948, UN Resolution 194 mandated free access to Jerusalem, other holy places, and granted diaspora Palestinians the right of return to their homeland—Israel to pay compensation for lost property to families or individuals choosing not to return. In May 1949, UN Resolution 273 gave Israel UN membership, conditional on it accepting resolutions 181 and 194, and "unreservedly (agreeing to honour) the obligations of the United Nations Charter." Israel has flagrantly violated them throughout its history, inflicting nearly 70 years of state-terror on defenceless Palestinians. But out of the ashes of US policy, something better can arise. Russia should step in to give badly needed leadership. Paradoxically, what Trump has done this week may bring about a new initiative to drive forward a genuine peace process. Comment: It's not simply Jerusalem, it's all of Palestine. Jews Israelites who were exiled to Babylon after the destruction of Judea established a Jewish community that lasted continuously until modern times, a period of more than 2,500 years. For well over 1,500 of those years the Babylonian Jewish community flourished to the point that, after the destruction of the Second Temple, they even became the undisputed centre of Jewish life (jewishhistory.org). Khazar Jews have occupied Palestine for only 69 years. December 7, 2017 — Trump's action, however, was not merely—as it is widely being cast, particularly in Europe—an act of irresponsibility or even madness. Rather, it is bound up with the broader aims of US imperialism to escalate its military intervention in the Middle East, particularly to roll back the growth of Iranian influence in the wake of the successive debacles suffered by Washington in Iraq, Libya and Syria . . . the determination of Jerusalem's status had to be the product of "direct negotiations between both parties," and that "Everything which worsens the crisis is counterproductive." Trump's decision has been invoked by the German ruling establishment to promote the country's rearmament and more aggressive pursuit of its great power interests on the world stage . . . The prospect that the provocation over Jerusalem will fuel Islamist terrorism is no doubt already factored into Washington's calculations. Terrorist attacks serve as useful pretexts for war abroad and repression at home. Comment: "World War III is to be fomented by using the differences the agentur of the Illuminati stir up between Political Zionists and the leaders of the Moslem world. War is to be directed in such a manner that Islam (the Arab World including Mohammedanism) and Political Zionism (including the State of Israel) will destroy themselves while at the same time the remaining nations, once more divided against each other on this issue, will be forced to fight themselves into a state of complete exhaustion physically, mentally, spiritually and economically. Can any unbiased and reasoning person deny that the intrigue now going on in the Near, Middle, and Far East is designed to accomplish this devilish purpose?" (biblebelievers.org.au). Comment: "Although Flynn's pre-inauguration machinations have been viewed mainly as part of the story of the influence in US politics of Russia, the foreign country exerting influence in this case was not Russia (which voted for the resolution) but instead Israel . . ."
In the federal grand jury indictment of Donald Trump's national security adviser, retired US Army Lieutenant General Michael Flynn, Justice Department Special Counsel Robert Mueller clearly states the foreign power that colluded with the Trump presidential transition team before Trump's January 20, 2017, inauguration. That foreign power was not Russia, or China, or Britain. It was Israel. "Israel's influence is the heart of the matter . . . as for Russia's collusion with the Trump campaign–Russia did not agree to delay or defeat the UN resolution. No, the next day, December 23, Russia voted in favour of UN Security Council resolution 2334 to condemn the settlements. The US abstained, and the resolution went through, 14-0. And Donald Trump tweeted that things would be very different when he became president . . . Who were Trump and Kushner trying to please through these efforts . . . Benjamin Netanyahu, the Israelis, through their proxies the US donors Sheldon Adelson, Bernard Marcus and Paul Singer—three neoconservative billionaires behind Trump . . . So all the Russian collusion is a lot less interesting than the Israel collusion. The press likes to say that those who ascribe power to the Israel lobby are conspiracy theorists. Well, here's your conspiracy to subvert US policy . . . the elephant in the room . . . (mondoweiss.net). December 6, 2017 — President Eisenhower [that terrible Swedish Jew] . . . required that the only plan for fighting Soviets, under any circumstances, such as an encounter in the Berlin corridor, the access to West Berlin, or over Iran, which was already a flashpoint at that point, or Yugoslavia, if they had gone in—however the war started—with an uprising in East Germany, for example—however it got started, Eisenhower's directed plan was for all-out war, in a first initiation of nuclear war, assuming the Soviets had not used nuclear weapons. December 11, 2017 — The increasingly bellicose stance toward North Korea, which threatens to engulf it in a war far more disastrous than even the invasion of Iraq, has been a leading driver of speculation over the possibility of a White House palace coup. December 7, 2017 — More than eleven years after his death, a second trial chamber at the UN War Crimes Tribunal in The Hague has concluded that former Serbian president Slobodan Milosevic was not responsible for war crimes committed in Bosnia where the worst atrocities associated with the break-up of Yugoslavia took place. Buried in a footnote deep in the fourth volume of the judgment against Bosnian-Serb General Ratko Mladic the judges unanimously conclude that "The evidence received by the trial chamber did not show that Slobodan Milosevic, Jovica Stanisic, Franko Simatovic, Zeljko Raznatovic, or Vojislav Seselj participated in the realization of the common criminal objective" to establish an ethnically-homogenous Bosnian-Serb entity through the commission of crimes alleged in the indictment. Comment: One of the cruellest and most cynical moves of Washington in its entire dark "regime change Syria" chapter. Serbian media sources are reporting, based on quotes from US Embassy Belgrade personnel, that the United States has sought and been given assurances by the Serbian government and military that Serbian de-mining experts will not be deploying to Syria to assist in removing the ubiquitous horrific mines and other explosive devices left behind by a retreating ISIS . . . (strategic-culture.org). Hosea 6:1-11, "Come, let us return to the Lord: for He has torn, and He will heal us; He has smitten us and will bind us up. He will revive us after two days: On the third day He will raise us up, and we will live eternally." [Hosea was prophesying the birth of Israel in one day, but before God can return to His servant nation He must restore His end-time Bride to the apostolic faith, finish the mystery of God, and bring us to maturity "in the unity of the faith for the manifestation of the Sons of God and the translation" (Malachi 4:5, 6b; Romans 8:19; Ephesians 4:13; Revelation 10:7). Israel is God's timepiece and "One day is with the Lord as a thousand years, and a thousand years as one day" (II Peter 3:8). Hosea wrote in 780BC: we are well into the third day: 780 + 2,017 - 1 (no year "0") = 2,796 years. Newsletter 1002 taught that pending completion of "the silence in heaven the space of about half an hour" (Gk.) 'chronos' "time is no more," and (Gk.) 'Kairos' or opportunity time is over (Revelation 8:1; 10:6) because the Church Age or PART-Word saints are redeemed and the mystery of the Seven Seals is revealed. Thus Christ's Mediation for ignorance of the fullness is fulfilled and Redemption is over as His end-time Bride and the 144,000 elect Israelites were foreknown as receiving the fullness of the Word, fully redeemed in Christ on Calvary and have no need of intercession. In this study our focus will be upon Christ's end-time Bride whose presence in the background of this chapter is unrecognized by scholars]. "So let us know, let us press on to know the Lord: His coming forth is sure like the dawn; and He will come for us as the rain, as the latter [rain in late February, March and April which will be resurrection time for Christ's Bride] and the former rain [of the ministry of Israel's two prophets from mid-October to mid-December]. What will I do to you, Ephraim? What will I do to you, Judah? For your love is like the morning cloud, and soon vanishes away like the dew. Therefore I have hewed them by the prophets; I have slain them by the Words of My mouth: and My judgment shall go forth as the light of revelation, clear, victorious and beneficent, leaving sinners confounded without excuse. For I delight in love and not sacrifice; and in the knowledge of God more than burnt offerings. But like men they have transgressed the Covenant: they were faithless to Me. Gilead is like a city of evil-doers, besmeared with blood. As the robber lurks, so does a band of priests. Upon the highway they murder those on the way to Shechem [a city of refuge]; they commit wickedness. In the house of Israel I beheld an abomination: Ephraim committed whoredom, Israel is defiled. Also there is a harvest appointed for Judah, [I will root out ungodliness and deliver] when I restore the fortunes of My people". 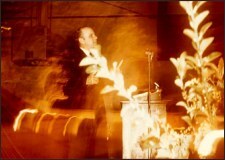 Brother Branham also saw Christ's end-time Bride in Ezekiel 37, for we must have our revival and depart before Israel's dry bones can march toward Zion. Quoting Joel 1:1-4 and 2:25-26 he said, "Four killers took it. Four messengers of death killed the Bride Tree with dogmas, and four messengers of righteousness restore Her back again. Christ is the Bridegroom from the Garden of Eden! The Bridegroom Tree without the Female can't bear fruit, so He's got to have a Bride Tree. She has got to be born of the same material, the Word made flesh in the Tree. Hope you get it. It's the same Life in this female Tree as It is in the Bridegroom. "The works that I do shall you also." Is that right? He was the Bridegroom. "Prophesy, son of man. Can these bones live?" What's the four stages of that coming forth of that Church? What's the four stages of Ezekiel's dry bones coming forth? But the Life only come, not when the sinew skin was on them, but when the wind blowed upon them. When that fourth Message of Life came back. "I will restore, saith the Lord" (Joel 2:25; Malachi 4:5, 6b; Matthew 17:11). Hallelujah! Glory! Praise be to God. The fourth Light will bring forth the same signs. Watch. Justification brought back the pulp. Sanctification brought back the bark, doctrine of holiness. What brought back the leaf? Pentecostals. What is it? Pentecostals, leaves, clap their hand, joy, rejoicing, Pentecostal. What? The fourth was the Word, Itself. 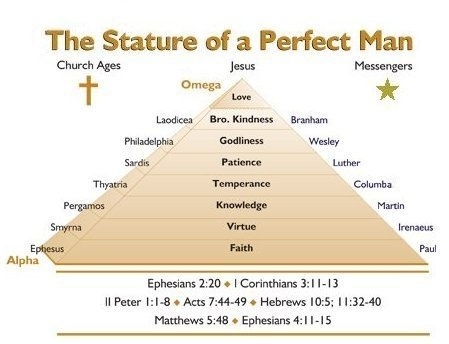 The Word made flesh, fruits of the proof of the resurrection sign that Christ after justification, sanctification and the baptism of the Holy Ghost have been planted, organizations died out, and Christ has again centred Himself like that cap of the pyramid. First line, justification; sanctification; baptism of the Holy Ghost; then coming of the Cap. What is it? That Holy Ghost bunch being honed out so that it can fit with the same kind of ministry He had when He went away, so when He comes back, it'll catch the whole thing in the Rapture, where they're justified, sanctified and baptized with the Holy Ghost. That pyramid will stand again. The House of God will live again. The Tree of Life is growing again (Restoration of the Bride Tree, p. 75:6 – 76:2). And then the Word moves on down into the Body, from the Head. What is it? This same Word. Nothing can be added or taken from It. So that same Word moves from the Head, as the Day comes close, down into the Body, down into the Body, vindicating that they are One. They are Husband and Wife. They're flesh of His flesh, Word of His Word; Life of His Life, Spirit of His Spirit. See? Amen! How do you know it? Bears the same record, same fruit, same Word. 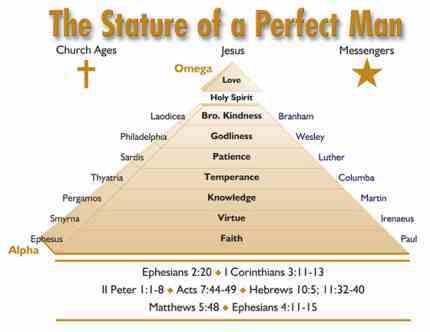 See, manifests Christ; same Life, same God, same Spirit, same Word, same Book! Amen! Same signs, "Things that I do shall you also." Oh, hallelujah! My! Notice, the vindicated Word in His Body is His very victory and the reason of His death. See, the death, not in the Spirit; when He died, He only died in the flesh. His Spirit went to hell and preached to the souls in prison. That right? His flesh, only, died, then He raised it up again and quickened it. Quicken means "made alive," His flesh, which was His body. And that's the Word. It's been laying dead for years, but It gradually begin to come in the Reformation, and now She is standing upon Her feet! Oh, how I wish I had time to go back into Ezekiel, and pull out them "dry bones," and show you. He said, "Can these bones live again?" He said, "Prophesy!" How can prophecy come? Only through the prophet. It's the Word of the Lord. "Hear ye, dry bones, the Word of the Lord!" And sinews, skin come upon them, and they stood up a mighty army, and begin to march towards Zion. Glory to God! That's Him. That's Him, the victory (I Corinthians 15:50-54). He proves His resurrection Life then as He a vindicates Himself. She, the Bride, is independent from all others. She's an independent Woman, a great speckled bird that's different from all others. You remember the Bible on that, "The great speckled bird." She had His Name, She had His Life. How did they speckle the bird? They were both white, and then they pulled the head off of one bird and drained the blood out upon the other bird. And the other bird was speckled with the red blood, and it flopped its wings like this, and the blood cried, "holy, holy, holy," as it bathed the ground. So Christ, the dead Mate, put His Blood, His Blood from His Life, into us; carrying His Blood, crying, "Holy, holy, holy, unto the Lord!" It's an odd-looking bird. Sure, it is. But She, the Bride, is identified by Him, and She is independent from all others. "Keep thee only unto her as long as you both live. Keep thee only to Him, the Word," no, no adultery, not one sign of denomination, not one sign of creed, no adultery at all. The Word, and Him alone! "On Christ the solid rock I stand, all other grounds is sinking sands," said Eddie Perronet. Uh-huh. That's it, Christ, the Word! He was the Word; He is the Word. And the Church becomes the Word, by Him making Her a part of Him, and that's the Word again. Personally identified by Him, His property alone! His property alone! She is redeemed by Him, through Him, for Him, and for Him alone. That's right. The Devil is howling that it's being revealed (Christ in the Mystery of God Revealed, p. 78:595-602). Citrus fruit, say lemons, will grow in an orange tree living by the life of the orange tree yet bearing its own fruit. 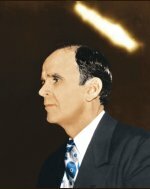 Brother Branham explained, "the church, so-called, only is a grafted sucker, living under the name of religion, under the name of the church. Catholic and Protestant, just suckers, pulling from the strength of the Vine; and yet bearing the fruit of what they are, because they wasn't converted. They wasn't in the original, predestinated plan of God, that's the reason they have to deny the Word and bear other kind of fruit. The real genuine tree, in its root, was predestinated to bring forth oranges on an orange tree. Jesus said, "I am the Vine; you are the branches" (John 15:5). But if that tree ever puts forth another branch, it will bear its original fruit. And there has got to be a restoration of all these things, right at the end of the Vine. There is to be, come forth, a restoration, an evening Light to light It up and to make It right. But it will come out of the Vine, not a denomination that's grafted into It; but original production of the Word. It's to come forth for the evening time. "And there will be Light in the evening time" (Zechariah 14:7). It takes the Light to ripen It. See how perfectly the Scripture is! "A day that won't be called day or night." Fruit cannot ripen unless the sun ripens it. No matter how much you preach, whatever you do, it cannot be ripened, it cannot be manifested, it cannot be vindicated; only by Him Who said, "I am the Light of the world," the Word. So there has to come forth a Power, the Holy Spirit Himself, to ripen, or to vindicate, or to prove, or to make manifested that what He's predicted would happen in this day. The evening Light produces that. What a time! Now, Hosea said, in 6:1, "Return to the Lord." Remember, he said that they would be scattered, and they were. He said, "They'll return to the Lord, after they had been scattered, and He would, will bind them up." Notice, "Return . . . Be scattered; the second . . . They were torn, and was blinded." That's just exactly what happened. "He will heal us, and bind us up." Like Ezekiel 37, "The dry bones, the valley full of dry bones." Ezekiel saw it, their return again. You know, the Jews Israelites were blinded for the very purpose that we could have sight. They were torn apart, and scattered, as a nation, and rejected their Messiah; that we might receive the Messiah, that there might be a people called out of the Gentiles for His Name's sake. [A Bride Tree]. Now, the man comes forth, and the woman takes his name. These blinded Gentiles who can't see that Name, "the Lord Jesus Christ," in baptism! It's just too bad, but it has to be that way. The Jews, they had to not see that. There is only one can see it; that's the one who is predestinated to see it. Otherwise, you'll never see it. The Jews could not see that being their Messiah. And, yet, they were scholars and theologians, man of great renown scholarship, read the same Bible that you read. Now, after it's been made known to us, we can see it plain, that was Messiah. But, they couldn't see it, neither can they see it today. They are prophesied to be blinded, too. The church, in this day, is prophesied to be blinded, to reject the evening-time Message. Revelation 3:17-20 said so, "Thou art wretched, miserable," notice the church's condition [in the vision] the other night, "naked, blind, and don't know it." Lord Jesus, be merciful to us! The Bible said she was "naked." And the visions showed me she was naked and didn't know it, and "blinded." As Israel was blinded so that the Gentiles could come in, now the Gentiles are blinded so the Bride can be taken out and Israel can receive the Feast of Trumpets. Just perfectly! "After two days He will revive us, or give us a revival, bringing us together, the Jews, Israelites" speaking on these Trumpets now. "And we shall live in His sight, or have Eternal Life. See, we'll be in His sight." The Bible said here in Hosea, said, "And we shall live in His sight; Life, have Life in His sight." That's His Own Life, Eternal Life, "have Life in His sight". [Thus Israel will be born as a nation short of seven years after our Homegoing, gathered in the Land of their Covenant in the first half of Daniel's Seventieth Week by the revelation of their Seven Trumpet mysteries under the Sixth Seal that manifests coincidentally with the Seventh Vial and the Seventh Trumpet. "And it will come to pass in that day, that the great trumpet shall be blown, and they shall come which were ready to perish in the land of Assyria, and the outcasts in the land of Egypt, and shall worship the Lord in the holy mount at Jerusalem" where once stood Al Aqsa Mosque and the Dome of the Rock (Isaiah 27:12-13; 29:6; 18:1-3; Zechariah 14:1-5; Revelation 16:19). [We live just before this hour. The first and last Trump's unlawful expropriation and return of Jerusalem to descendants of the Jebusites from whom King David wrested the city is a sign of the soon-coming invasion and utter defeat of the modern Israel state and a mass exodus of Israeli self-styled Jews, enabling Semitic Israelites to safely return to the Land for their redemption]. "As a minister of the Gospel, I can't see one thing left but the going of the Bride. And the Bride has to be taken away before the Israelites can recognize what's happened. They were scattered, blinded, and now gathered. What's left? The Bride to be taken out of the way. Waiting for the going of the Bride so their prophets of Revelations 11 can call them to the feast of Trumpets to make them to recognize what they have done. Remember, right between those Seals, came forth the Sixth Seal [in Revelation 6:12-17 before the Seventh Seal of Revelation 8:1]. And there was a hundred and forty-four thousand, chosen and called [in Revelation 7:1-8]. And between the Sixth [Trumpet in Revelation 9:13-21] and [the] Seventh Trumpet [in Revelation 11:15], Revelation 11 appears right there exactly in line with the Sixth Seal [which marks the close of the Christian dispensation and the commencement of Daniel's Seventieth Week]. What to do? What was it to do? And this was to bring forth two witnesses, Moses and Elias, prophets [of Revelation 11:3-11; Isaiah 11:11-16; 18:1-3; 27:12-13; Zechariah 4:11-14; Matthew 24:31]. Which, the Jews Israelites only believe their prophets. And they'll come forth with the sign of the prophets, and their work will [replicate the ministry and miracles of the former Moses and the first Elijah]. Showing one thing, that. . . when you leave this world, your nature doesn't change. If you're a liar now, you'll be a liar there. If you're hot-headed here, you'll be hot-headed there. If you're a doubter here, you would be a doubter there. Men and women, it's time to shake yourselves and to examine yourselves, and see where we are standing, for death does not change it. Death doesn't change your nature. Doesn't change your faith. Doesn't change nothing in you but your dwelling place. So, which away your nature is this morning! If you're a doubter of God's Word, you would be a doubter over there. I don't care how holy you are, how you live, and how good you live, it wouldn't change you one bit to die, just your dwelling place. And if you can't accept the whole Word of God the way It's written, you wouldn't do it There; so, don't worry, you won't be There. You've got to accept It in Its fullness, in the power of Its vindication and the revelation of what It is, then you become a part of It. It's only His Word that He'll raise up, as He did His Word on the first Easter morning. Only His Word came forth, and those who had died in His Word, believing His Word and vindicated His Word. Notice, now, that's been twenty-seven hundred years ago. They were scattered, they were blinded, and now they've been gathered. The next thing is that they are to receive Life. The Gentiles are called out. The Bride is ready. The [threefold PROCESS (I Thessalonians 4:16) of the rapture has been ongoing since Christ opened are revealed the Seven Seals in 1963 and the first resurrection and translation] is at hand. Can we realize that? Can we actually believe that? Is it a story that's been told? Is it a myth, to us? Is it a something that sounds real? Is it something that we, outside, can believe? Or, is it something that's in us, that's part of us, that it's more than life to us? What attitude do we set in, this morning, in this tabernacle? Remember, it'll be a small flock that receives It . . .
Oh, you men in other lands where you'll hear this tape, can't you wake up, my brother? Or, does It blind you? Would you throw It out and call It false prophecy? When, It's vindicated right before you, by the world, by the time, by the peoples, and by the Holy Spirit Who wrote It. It's vindicated, both naturally, spiritually, materially. Everything that He said is fulfilled and proven. The Seals are open. It's revealed to us. We see what they left off. You that want to debate and fuss about the serpent's seed, and water baptism, and so forth, you're blinded and don't know it. The god of this world has blinded you, to it, and you don't know it. He said, through Hosea, "I have hewed." Now watch, Israel He's talking to. "I have hewed," or other words, "I have chopped, chopped them out, through the prophets." That's how God does His people. He chopped them out from the rest of the nations. What by? His two-edged Sword, His Word. He chopped them, His nation, from the nations. He chopped His nation from the nations, by the prophets, His vindicated Word (Hebrews 4:12). So has He chopped His Bride from the denominations, by His Word; promised by Malachi 4, in the last day. Chopped out His Bride, hewed Her from the rest of the churches! Hewed out His Bride (Amos 3:3; Revelation 18:4)! What time is it, brother? What time is it, minister? Do you see the time of the day, and the sign you're living under? Can you understand it? Do you see it? Everywhere now, there's no revival. Everybody is complaining, ministers crying. I was reading one of the outstanding papers that comes here to the church, a very fine paper. And I know the editor, and I know the people. And they are godly people, very fine, Brother and Sister Moore, of the Herald of His Coming. One of the finest papers on the field, they hardly print anything unless it's about, "Fast, pray! Fast, pray! Sound a trumpet! Get . . ."
Why do they do that? . . . They have not recognized the awakening of the Bride. See? By being a Christian, they feel the pull of the hour, but they haven't recognized what's been done. That's what's making them feel that way. They know something is supposed to happen, but, see, they're looking for it way off in the future, to come, when it's already happened right by you. That's the same thing they did in the old days. They was believing in a coming Messiah. They believed that there would be a forerunner come. But it was right on them, and they didn't know it. They didn't recognize it. They believed there would come a forerunner that would forerun the Messiah, and they cut his head off. And killed their Messiah, because it was prophesied that they would be blinded. Hosea said so. And the same Spirit, that spoke through Hosea, spoke through John and said the church in this last days would be "naked, and blind, and would put Him outside of the church." They failed to see those prophecies fulfil. But, being in there, they realize that something has got to happen. They just don't get it. They don't realize it. Much like the Jews of old times; blinded Laodicea; riches, theology, hostile with the Church, hostile towards the Message. Look how hostile those Jews was with John. Look how hostile they was with Jesus, when He was the very One that they claimed that they were looking for. Remember the blind man? The father and mother couldn't even answer; they was afraid. Because, they said, "Anybody that went to see Jesus, or attended His meetings, they would be excommunicated." But, that blind man could speak for himself. "I, who was once blind, can now see" (John 9:1-41). I, who didn't know these things, It's been made known to me by the Holy Spirit. Turn loose, denominations, because they're coming, anyhow! "If I be lifted up from the earth, I'll draw all men unto Me". Nathanael recognized it (John 1:43-49). He knew it. Just as Moses' Scriptural proofs, vindicated Word. Moses knew that that was the promise of the day, because it was Scriptural, no matter how strange. He said, "Who can I tell them . . . I'll tell them I saw a Light back here in the wilderness. How can I tell them now that there was a Light back here, and this Light told me go down there?" He said, "Surely, Moses, I'll be with you." He didn't show Hisself down in Egypt; just only by miracles and signs. But when He got them all gathered together, He appeared to them again, and vindicated Moses' ministry before the Elected and called-out. When that prophet had chopped them loose from that nation and brought them into a place, then the Pillar of Fire appeared again, and on top of Mount Sinai. Parallel it with today. [He has gathered us together and the Shekinah has appeared to us again]. Amen! Praise be to God! It's more than life to me. And my age begins to creep on, and I see the hour of vulgarity and immorality sweeping the lands and things, then I look back and see what's happened. My heart leaps for joy, knowing that after a while this earthly tabernacle of habitation will be dissolved, but I got one waiting yonder. I'm trying to pull a people, chop them from these things and things, to pull them out; to show them, by the Scriptures, that God is standing there; with a vindication of the Pillar of Fire, which hundreds and thousands have seen, and even had It took, before, with a camera, time after time, to prove it. Impersonators rise up. Sure, it's got to be done. Impersonators rose up in the day of Moses and done the same thing. God said, "Separate yourself, Moses. Don't hang around them. I'll swallow them up." And the world got them. And so is it today; go right back in the world, money schemes and everything else. See? Moses' Scriptural sign, and they recognized it! He was that great prophet of God that went down there to deliver them. They recognized the sign. He was the exact Scriptural promise, vindicated. Jesus was that promise of the Scripture, vindicated to the woman. Or, He was the Interpretation. Jesus was the Interpretation of the Scripture. His Own Life interpreted the Scripture. Don't you see the Message of the hour? Can you recognize where we are? The Message itself, from the Scripture, interprets to you the hour we're living in. It's the interpretation. Jesus said to Israel, "If you had only have known your day." One time, setting on Mount Olives, He looked over, said, "Jerusalem, O Jerusalem!" He wept. He looked down. He seen. Not in any comparison, maybe, way. The other morning, about ten o'clock, when I saw that prostitute church. Down in your heart, you feel the Holy Spirit dropping tears. "Jerusalem, O Jerusalem, how oft would I have hovered you. But what did you do? You killed the prophets that I sent to you. You murdered them." And the Messages has been sent to the church, today, has been murdered by their denominational dogmas. The Scripture has been murdered by their dogmas. Jesus said, "If you'd have only knowed your day! But it's too late now." So is it with the churches! I do believe, with all my heart, she is past redemption. No matter what you want to think about it, I believe she is past redemption, and has been, for the past five or six years. I remember. You remember Chicago. [Seventy ministers were coming to be baptised in the Name of our Lord Jesus Christ. Not one of them attended the meeting]. Watch what's happened since then, and watch it keep on happening. See? Remember, my name is before it. It's stuck out there. It's THUS SAITH THE LORD. See if she hasn't dropped, continue. "But as Jannes and Jambres withstood Moses and Aaron, so will they; man of reprobated mind concerning the Truth," been perverted into dogmas and teachings of the church, instead of the Bible. And then Jannes and Jambres could do anything that Moses could do. So do these man of reprobate mind concerning the Truth, resist It. Their folly will be made known." When that Bride takes Her stand and moves up into the skies, it'll be made known, don't worry; like Moses, when he took the children of Israel, and took the flight out of Egypt, and Egypt sunk. All right. They can't recognize the evening Light. That's what's the matter. She just doesn't recognize It. She is too blind. The Bible said she was. Russia only received her place in the world, in science, no more than about forty years ago. You know, when the First World War come on, they never . . . They ignored Russia, but she recognized her place. She had to do it to fulfil the Scripture. You know my prophecies of what I said would happen, how all of them would gather in communism. Now she leads the world in science. We're a way back behind her. All the rest of the world is behind her. She leads her place. She just recognized she had some brains, too. God had to drive Russia up there, in communism, to do exactly what's been prophesied she would do. [The "last Trump's" expropriation of Jerusalem ensures an imminent fulfilment of prophecy: Israel's defeat, the repatriation of non-Semitic, anti-Semitic self-styled Israeli Jews to Eastern Europe and the re-communizing of Russia. Chief Rabbi of the USA, Steven S. Wise, commonly known as the "Red Rabbi," said "Some call it Marxism, I call it Judaism." In course of time Russia will destroy Vatican City State and annihilate the USA]. Notice, man has the same six senses he had six thousand years ago. Six thousand years ago, with the senses he had, he contacted his earthly home and served God. And now, in the past seventy-five years, that man has come from a horse and buggy, to an astronaut. Why? He turned away from his faith in God, and turned it over to his senses and his ability as a human being. Did you notice it? He quit trusting God. He trusts himself. Now, the church has not recognized her day. Like Israel, forced back to Palestine, she is going to be forced into the World Council of Churches. Why? She didn't recognize her hour. "People, come out of her, be not partakers of her sin!" Flee, your life, or you'll be caught with the mark of the beast and can't do nothing else about it. "Let him that's filthy be filthy still. Let him that's holy," not will be holy, "holy now. Let him that's holy," not a bobbed-haired woman; she can't be. Now, that sounds very flat, but that's the Scripture (I Corinthians 11:3-16). The Bible says, "She dishonours her head," and her head is her husband. His Head is Christ, so she dishonours Christ. How can she be "dishonourable" and not be "filthy"? "Let she who cuts her hair keep it. Let she that wears shorts keep on wearing them. Let he that denies the Word keep on denying It" (Revelation 22:10-19). "But let him that's holy be holy still. Let him that's righteous be righteous still; the righteous Word of God, the Son of God made manifest. Be holy still, righteous still!" Recognize! Yes, sir! The church has not recognized her day. Like Israel, back in her promised land, she don't know how she got back there. National force put Israel in her homeland; national force will put the church in the World Council of Churches; but the power of God will put the people in the Bride. The world forces this way, and the world forces that way, but God forces upward. The Spirit of God, which is the Word of God, "My Word is Spirit and Life," will put the Bride in Her place. Cause, She'll recognize Her position in the Word, then She's in Christ, will put Her in Her place. [It is that simple]. No national force will do it. But the national force did drive Israel to the homeland; the national forces of the Council of Churches will drive every organization into it; but the Power of God will raise the Bride into Glory, out of it. Oh, people, recognize your day, as Jesus warned you; the sign of Sodom, and the church's conditions of this day (Genesis 18; Luke 17:28-30; Hebrews 4:12). Look what He said in this day would take place. Listen to it real close. The sign of Sodom would take place in the day; sign like Abraham, that day before Sodom, that was called out. All these things that was prophesied, will be taking place now (Luke 17:28-30; Hebrews 4:12). Watch the day you're living. We've went over it and over it. Now He has promised to send you Heavenly Light, to ripen the Word Seed that would be sown for this day. The Seed is in Here. The Seed is the Bible. Why? Jesus said so. "The Word is the Seed that a sower sowed." Now, before you can have any crop, no matter if you sow the seed, it's got to have light to ripen that seed, or it'll rot and won't do no good; it'll perish. But if it's got seed in the ground, the right ground, with the right kind of a sunlight on it, it's got to ripen. And He promised that in the last days, in the evening time, the Son would come out to ripen that Seed. The Seed is being preached. The Son of God is ripening that Seed, by vindicating It, making It push out before you and proving that It's right. Do you get it?